For many people, it may seem that becoming frail is a natural part of growing old. After all, seniors tend to lose muscle mass as they age and develop chronic diseases. As a result, they may become significantly weaker and less mobile. But experts say that while growing old is inevitable, becoming frail is not necessarily so. "Getting enough exercise and the right nutrition can delay or even reverse the condition," said Associate Professor Reshma A. Merchant, head of the National University Hospital's geriatric medicine division. A frail person has reduced body reserves, making him less able to bounce back to good health when health problems occur. He may be more susceptible to falls or is more likely to require hospitalisation. However, symptoms are not always easily spotted, especially if people believe conditions such as fatigue and weakness are part of normal ageing. They may, for example, find themselves walking more slowly than before. Another telltale sign is unintentional weight loss of 4.5kg or more in the past year. Getting enough exercise and the right nutrition can delay or even reverse the condition. ASSOCIATE PROFESSOR RESHMA A. MERCHANT, head of the National University Hospital's geriatric medicine division, on how to keep frailty at bay as one ages. In fact, a team of experts here has developed an "IPPT test" to identify frail seniors. Named after the Individual Physical Proficiency Test for the uniformed services, the nine stations of this "IPPT" for seniors measure strength, flexibility and balance. They are done under supervision. One of the tests is for seniors to walk a distance of 10m. By measuring the time taken, doctors can gauge a person's strength and general health. Seniors should complete the walk in about 12.5 seconds, said Associate Professor Ng Yee Sien, a rehabilitation physician at Singapore General Hospital and Sengkang General Hospital. In another test, the senior rises from a sitting position as many times as he can in 30 seconds, without using his hands. Those aged between 55 and 60 should be able to do five such chair rises in less than 10 seconds. The test measures their lower limb strength. The caveat is that these tests are meant to be taken with a questionnaire for experts to assess a person's mood, nutrition status and quality of life, among other things. Conditions like depression can be a risk factor for someone becoming more frail. These steps will help the experts decide if a person can truly be considered frail. Even if you may not be able to complete one of the tests, you do not necessarily have anything to worry about. Prof Ng said: "Any one of these tests is just one component. People need to be evaluated in totality for a more complete picture." He headed a pilot study of about 100 seniors and found that 2 per cent of them fell into the frail category. However, nearly a third of them were pre-frail - that is, at risk of developing frailty. Both groups scored poorly on the walking speed and chair stand tests. For now, this screening test is being carried out only at community organisations, such as senior activity centres. But how can we help ourselves - or our elderly parents - avoid becoming frail as we age? 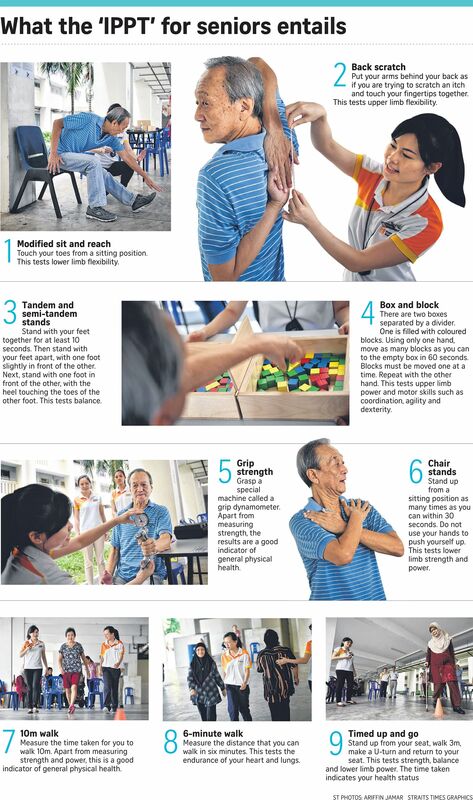 One method is to do strengthening exercises, said Ms Lee Sin Yi, a senior physiotherapist at Tan Tock Seng Hospital. She said: "These involve the building up of skeletal muscle mass and strength." One should also do exercises for endurance, balance and flexibility. Taiji can improve balance and agility, while resistance exercises with weights or elastic bands can build strength. Swimming or walking, in the meantime, can help to boost endurance. Another tip is to review your medication with a professional, especially if you are taking many different kinds of medicines. This is because the interactions between incompatible drugs could cause side effects, said Ms Zubaidah Mohamed, assistant director of nursing for home care services at Farrer Park Hospital. "This can predispose patients to weakness and slowness. Certain medications can cause frailty," she said. "It is vital to have a thorough review of one's medication." After the review, experts may change the medication or reduce dosages to avoid these side effects. It is also important to eat right, said Ms Gin Lee, a senior physiotherapist at Mount Elizabeth Rehabilitation Centre. "Maintain a balanced diet that contains enough protein, vegetables, fruit and fluids, as well as all of the essential vitamins and minerals," she said. A person's social environment and cognitive health can also contribute to frailty. This means that any programme to reduce frailty should also focus on brain training, Prof Merchant said. She added: "Doing exercise in groups and meeting people are also important to delay frailty." Regular exercise and good nutrition are important in helping seniors avoid becoming frail. But how much exercise does one need and what kind of food should one be eating? Physical activity and adequate protein in one's diet can delay or reverse frailty, said Associate Professor Reshma A. Merchant, head of the National University Hospital's geriatric medicine division. For adults, the guideline is to do a total of 150 minutes of physical activity, three times a week. It is important to stay active throughout the day, such as by trying to walk 10,000 steps, said senior physiotherapist Lee Sin Yee of Tan Tock Seng Hospital. Anyone can start taking these steps at any age, although there is more reason to get down to it seriously after the age of 40. Dr Low Yen Ling, director of research and development at Abbott Nutrition Asia Pacific Centre, said that, on average, people lose 8 per cent of their muscles every decade, starting at age 40. This increases to 15 per cent each decade when a person reaches 70, raising the risk of falls, illness and poor health. She said: "Every muscle in our body is made up of protein. "As we get older, our body requires more protein to build the same amount of muscles." Seniors, she added, should start eating more protein-rich foods such as fish, lean meat, eggs or beans to improve their muscle health. Men should take 68g of protein a day and women, 58g a day, according to the Health Promotion Board. However, those with health conditions should consult a doctor before making adjustments to their diets and lifestyles.